A new age of medicine is upon us, and it comes in the form of personalized gene therapy. Recent developments have pushed the single-dose, potentially curative treatments with high projected price tags closer to launch. Thus, the benefit design and coverage for engineered genes to treat, prevent and cure diseases are a rapidly growing concern for plan sponsors preparing for the pharmaceutical pipeline. At the start of 2017, over 500 gene therapies were in active development with roughly 95 percent yet to reach Phase III trials. Still, it appears by mid-January of 2018 the FDA may approve two types of groundbreaking genetic therapies. Both are made and administered in vastly different ways, but they share alarming projections of near-term budget implications for employers using our current payment models. The long-term potential savings from curing conditions, such as cancer, blindness, hemophilia and more, has many in the medical community anxiously awaiting approval. It is important to appreciate the basics of genes and therapies targeting them to understand why high prices are expected and why new payment options should be considered. Comprised of DNA, genes give the instructions to make the proteins necessary for cells to function properly. When a gene mutation occurs, the proteins may be made faulty or not at all, which could lead to genetic disorders. The goal of gene therapy is to use normal gene copies as drugs to compensate for the malfunctioning or missing protein(s), which can be performed in two different approaches: in vivo or ex vivo. In vivo gene therapy involves transferring correctly functioning genes to specific cells inside the body through delivery vehicles called vectors. This is the approach Spark Therapeutics is using for its gene therapy, Luxturna™ (voretigene neparvovec), which treats a rare form of inherited blindness (Leber’s congenital amaurosis with RPE65 mutation) that impacts about 1,750 Americans. The one-time injection appears to be a cure for over 90 percent of patients in Phase III trials, with a low side effect profile. With the FDA giving Luxturna a priority review date of January 12, 2018, plan sponsors are awaiting the proposed pricing scenarios and should be seeing if their medical carriers can determine if any participants have the specific blindness diagnosis (a small subset of ICD-10 code: H47.22). Other uses of in vivo gene therapy in development have broader patient populations with expensive chronic pharmacy and medical costs, such as cystic fibrosis, hemophilia and cancer. Introducing “anticancer” genes to create tumor suppression proteins are still in the early stages of clinical trials, but an ex vivo cancer gene therapy was approved for a form of leukemia on August 30, 2017, which comes in the form of chimeric antigen receptor T-cell, or CAR-T, therapy. 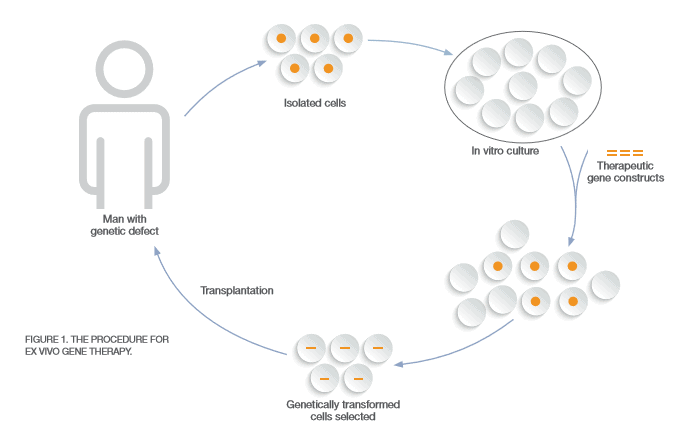 CAR-T therapy is considered ex vivo (Figure 1) since a patient’s cells are sent to a manufacturer and modified for implantation back into the patient with the goal of curing the disease. During the FDA Oncologic Drugs Advisory Committee meeting, the first CAR-T therapy, known currently as Kymriah™, was called “probably the most exciting thing I’ve seen in my lifetime” by Timothy Cripe, chief of hematology and oncology at Nationwide Children’s Hospital in Columbus, Ohio. That is because Kymriah™ sent 83 percent of children and young adults into remission with B-cell acute lymphoblastic leukemia (ALL) who had exhausted all other treatment options, which impacts about 600 Americans annually. ALL is just the beginning when it comes to future uses of CAR-T therapy. Other blood cancers are being treated in trials with CAR-T as well as solid tumors in the breasts, lungs and brain, which may require multiple injections. It is imperative to note that these genetic cancer treatments are intended for patients with refractory or recurring cancers. This is not only due to costs, but also to the significant safety concerns associated with gene therapy, especially CAR-T that has shown collateral damage by creating a super-charged immune system. In general, patients will need to remain hospitalized for at least one week to monitor for toxicity to therapy. High fever and flu-like symptoms, sometimes severe enough to require ICU admission, due to cytokine release syndrome, actually indicates a positive response to therapy, but can require administration of specialty medications, such as Actemra®, to control. The costliest expected side effect could be B-cell aplasia, which are low or absent B-cell levels needed to protect against infections, caused by CAR-T cells wiping out both cancerous and normal B-cells. Every patient in the Kymriah™ trials acquired B-cell aplasia, and it appears to be permanent, which must be treated monthly with intravenous immunoglobulin that can cost payers tens-to-hundreds of thousands of dollars annually. The permanence of developing the chronic, costly condition seems to be avoided by the other CAR-T products in development, such as KTE-019 for non-Hodgkin’s lymphoma that could be approved in late November 2017. How can employers manage gene therapy? Over the next decade, it appears gene therapies will begin to take a foothold in the treatment of rare, genetic conditions with the potential to expand to more common conditions, such as diabetes or Alzheimer’s disease. The excitement surrounding these therapies is understandable, but so is the trepidation of payers who will be footing the bill for treatments that may cost over $1 million for each eligible patient. To reduce those fears, below are vendor strategies available today, as well as potential payment models that may apply if vetted properly. >> FIRST, start discussions with your medical carriers about how they plan to handle the complexity of gene therapies and ensure cost-effective usage. For example, the ex vivo therapies take weeks to develop for a specific patient and encompass different procedures at multiple locations. The billing and procedural codes should be optimized to represent the full cost of care as well as to best facilitate alternate payment methods. Perhaps more importantly, usage for unapproved diagnoses should not be billed back to the payer. Ask your medical vendor how they plan to protect your plan from this situation (e.g. prior authorization, limits based on severity). >> ONCE a new gene therapy is approved, self-insured employers with carved-out pharmacy benefits may see communications from their PBM to block these drugs from processing under the pharmacy benefit in order to ensure medical benefit administration. If you do not receive these types of emails currently for drugs with complex administration (e.g. Spinraza™), discuss this with your PBM and/or consultant to guarantee the plan is protected from suboptimal dispensing of costly therapies best suited for the medical benefit. >> REVIEW your stop loss policy to see if gene therapy coverage has limitations or is excluded altogether. Theoretically, stop loss carriers may try to laser patients for conditions with pending gene therapy diagnoses as well. THE STATUS QUO – Depending on the size of the plan, an approval of one gene therapy at a single-dose may be sustainable with the current payment system. However, manufacturers must demonstrate the economic value of avoided medical and drug costs by treating patients with each gene therapy to minimize the rationing and barriers to access similar to what happened with hepatitis C medications. Drug makers should also consider the downstream impact of potential side effects due to treatment (e.g. B-cell aplasia) when determining costs and value to payers. OUTCOMES-BASED CONTRACTING – Also known as pay-for-performance or value-based contracting, this philosophy has gained momentum with the rise of expensive specialty medications that can be thought of as a warranty between the manufacturer and the payer. A refund, typically in the form of rebates, or payment by the drug maker for additional rounds of treatment could be made if the initial gene therapy fails. Implementing this type of contracting has been a challenge, especially for employers, due to the extensive operational requirements as well as the desire to contract for chronic medications, which leads to less reliable monitoring of outcomes. The gene therapies that cure a condition with one administration may make this more feasible for employers with competent medical carriers. PAYMENT INSTALLMENTS – Spreading out the costs of gene therapies in the form of annuities either by months or years may be best for budgeting purposes and easier to implement than outcomes-based contracting. Ideally, the two strategies could be combined, so that all stakeholders come out ahead. One concern is that a manufacturer would launch at a higher price tag to increase its rate of return. Determining what happens when a treated patient leaves the plan would also need to be addressed. As the field of gene therapy evolves, so will the strategies and payment models. No matter the payment system, the fragmentation of our health care system will still pose its challenges. As seen with hepatitis C, payers may not realize the full financial benefit from paying for cures, especially for those employers with high employee turnover rates. However, some conditions, such as hemophilia and cystic fibrosis, with gene therapies in the pipeline could benefit immediately based on their current medical and pharmacy treatment costs. The question is: Will the therapies be priced appropriately with the patients and payers in mind over profits? Plan sponsors should take the steps to protect themselves now in the chances they might not like the answer. For reference information or to discuss further, please contact Matt Harman at mharman@employershealthco.com.